Involuntary Smiles: You Are Invited! 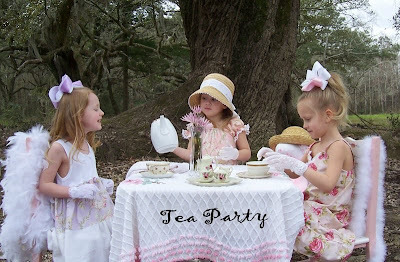 When I was a little kid one of my favorite things to do with my friends was to have a tea party. We would have sugar water and crackers or cookies. We would dress in our fanciest every day dresses (we weren't allowed to use our Sunday dresses) and sip sugar water while trying to talk in sophisticated voices (which generally turned out to be terrible Brittish accents that would have made an Englishman's ears bleed) about the most sophisticated topics (usually about how authentic we sounded). As I was sitting here, the sunlight streaming in through the window and warming my toes, I got a sudden longing for a tea party. I decided I am going to have one. Does anyone know a good place to buy a big person tea set? 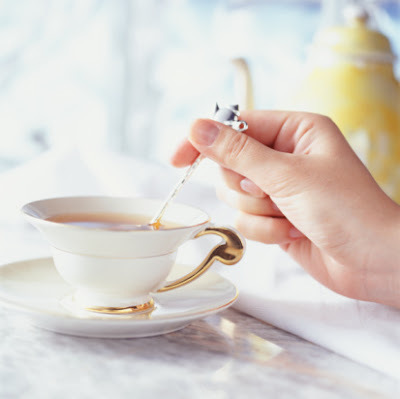 Does anyone want to come to my Tea Party? Remember, to come you must have a horrendous British accent, and you must be convinced you sound authentic. Only those who are qualified should apply... I mean come. It will be lots of fun. there are some pretty cute one at the link above. I bet you could come up with something pretty whimsical (if you don't mind it being mismatched) at the DI! Wow, such great ideas! I am so excited! When I get a tea set I will have an honorary tea party with all of you, regardless of which country or state you live in. Just talk in the accent for an hour or so, and we will call it good.